Yesterday we left Dockside Marina in Brisbane and sailed to our final destination of this season – Scarborough Marina up in the small town of Redcliffe. It took just a few hours – a two hour motor down the river from Brisbane to Moreton Bay and then another 2 .5 hours north to Redcliffe. 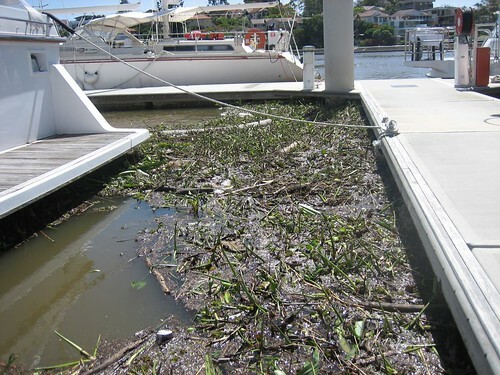 The Brisbane River was still filled with debris – logs, thick foliage, tires and bottles – from the 3 storms the previous week and we had to proceed very cautiously down the river. I stood on the bow as Mark steered and tried to alert him to any large submerged objects so he could veer around them. Our friend Jim on “Cardea” – who is sailing alone- followed closely behind us. As much as we enjoyed Brisbane, it was nice to leave the brown river behind us and head up into the cleaner water of the bay. Scarborough Marina is quite large – there are about 240 boats here – many of them belonging to Aussies – but a good number belonging to cruisers like us who are either leaving their boat here for the season – or just stopping off for a few months and touring the country. When we were about a mile from the marina we started seeing some blue blobs in the water and thought at first that there was garbage in the water – but it quickly became clear that it was not garbage – but very large, and abundant blue jelly-fish. There were thousands of them. They are actually very beautiful, but a bit creepy. We certainly won’t be doing any swimming here. There are also many sharks here – and not the kind you want to go for a swim with! There is a terrific seafood market just ¼ mile from us and all the marine facilities that we need to take care of our end of the season boat maintenance. Mark has a huge list of boat maintenance projects we need to get through before we leave. Happy Thanksgiving and happy birthday to Mark and his twin sister Frannie! 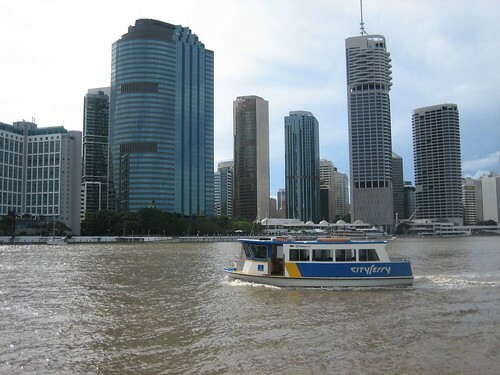 We are still berthed at Dockside Marina located in the middle of the city of Brisbane. Towering over us is a set of 25 story luxury condominium/apartment buildings making up a large new development called Dockside. There are still some buildings under construction and units in the newest buildings are still for sale. 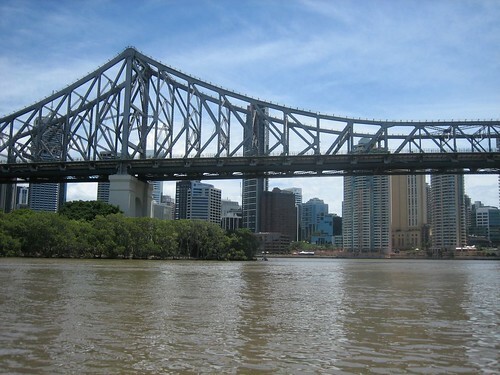 All of this is located on a narrow peninsula in the Brisbane River called Kangaroo Point. 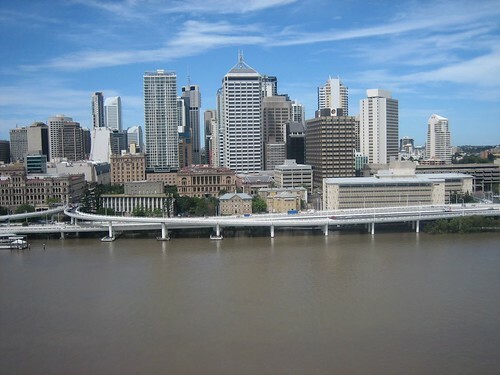 The central business district is right across the Story Bridge, or, more conveniently, a ferry stop away. We bought a weekly Tranlink ticket that provides for unlimited use of the ferries, buses, and train within the central city. At AUS$23 each, it is quite a bargain. Downtown is dominated by tall modernistic skyscrapers. There are restaurants and food courts everywhere. The densest concentration of shops is on Queen Street, a pedestrian thoroughfare with outdoor cafes and every imaginable type of store, including two underground supermarkets. On Thursday and Friday, we bought take-out sushi on Felix Street and then walked three blocks to the Botanical Gardens that front the river. 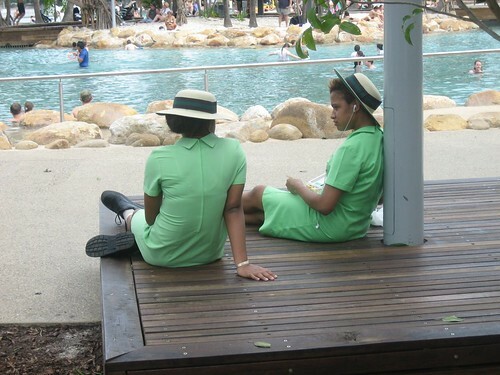 After dining at a picnic table in the shade, we walked the length of the park and then crossed the river on a pedestrian bridge (Goodwill Bridge) to the Parklands, a beautifully park that stretches out for at least 2 kilometers along the south bank of the river. 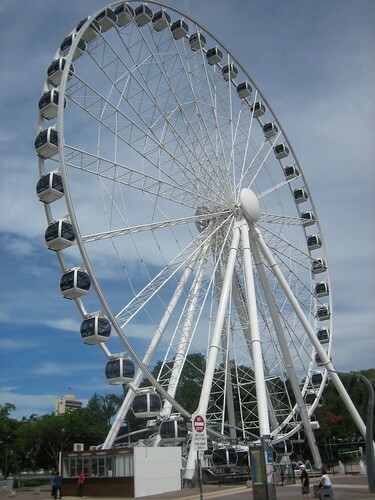 The Parklands contains restaurants and cafes, gardens, Griffiths University, the Performing Arts Complex (Concert Hall for the symphony orchestra, opera, and dance companies), the Museum of Art, an artificial swimming lake with a sand beach, and a gigantic Ferris wheel, among other things. The beach was crowded with mothers and children at one end, and teenagers at the other. We took a ride on the Ferris wheel, which provided us with an excellent view in all directions from the comfort of an air conditioned gondola. The weather has been hot and humid since we arrived. As we noted in our previous post, the most damaging storm in 25 years blew through Brisbane a few hours after our arrival. There have two more severe storms in the past few nights. 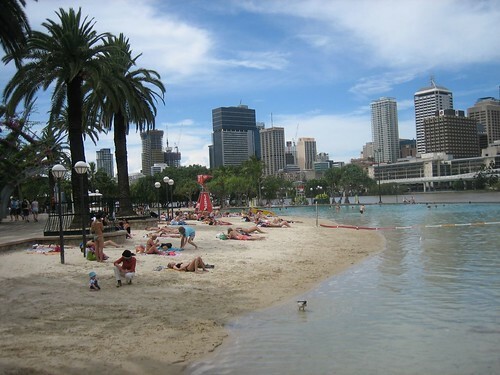 Having three storms in five days is very unusual for Brisbane, we have been told. The rain was torrential and by the time the third storm hit on Thursday night, there was serious flooding and wind damage. Roadway underpasses flooded trapping cars, roofs were ripped off houses, and there were power outages. 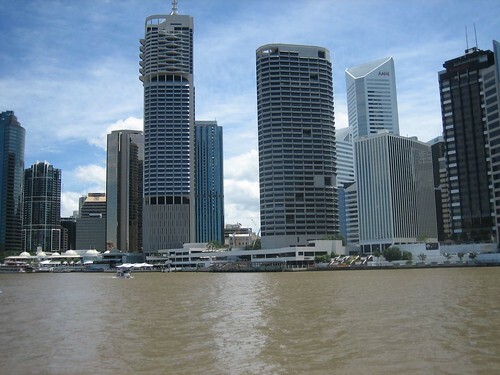 The Brisbane River rose and flooded its banks to the north and west of the city. The river turned chocolate color and by Friday morning masses of debris – tree branches, logs, masses of green foliage, and discarded junk from the river banks upstream – started to fill the river. At the ferry landings and marina and other places where protrusions stick out into the river, this debris completely covered the surface of the water up to a foot thick, and birds walked out onto it. In the evening we heard something whacking the hull of Sabbatical III and went out to find that a large log had wedged between the boat and the dock and a huge mass of debris had collected behind it. As Laura held the flashlight, I used a large pole with a hook to move the debris away from the boat. Local boaters told us that they have never seen anything like this since the great flood of 1974. Usually we are awakened in the morning by the wakes of the many ferries bringing people into the downtown area. This morning we slept in, undisturbed by wakes. It turns out that the river debris formed a hazard to navigation and all ferry service was cancelled quite suddenly at 6 pm yesterday (Friday) evening , just after we took the ferry back to the marina, and will not resume until Tuesday morning at the earliest. We had to use buses to get around today. The river is now eerily quiet, and the lack of roll from boat wakes which makes our time on Sabbatical III more pleasant. Our planned Monday morning departure for Scarborough Marina is unlikely to occur. With the river as it is, we would either damage the prop in a collision with some floating object, or overheat the engine as debris clogged the cooling water intake. We have had our departures delayed because of the weather many times, but never before because of debris in the water. On the bright side, this is a great town to get stuck in for an extra day or two, and all of this rain marks the end of a period of serious drought in Queensland. It is against the law to use a hose to wash a boat or water a lawn. Perhaps that will now change. Troops clean up after worst storm in decades! This was the headline in the Brisbane newspaper on Monday November 17th, the day after we arrived. As we approached Moreton Bay in Australia (on Sunday) where we were to make our first landfall since leaving New Caledonia, we heard on the radio that there was a “high wind” advisory for the area . We had known that a storm was predicted for the coast of Australia on Sunday, and had timed our departure from New Caledonia six days before, calculating that we would arrive before it hit . The storm was not supposed to arrive until late in the day and we knew we would arrive by mid-morning so we were not overly concerned about it. It was a gorgeous, hot and sunny day and our entrance into Moreton Bay was lovely – the huge bay was filled with kayakers and sailboats and also big cargo ships waiting to either drop off or pick up cargo from the docks at the Brisbane River. It was not terribly windy and the skies were perfectly clear. We got to Rivergate Marina and immediately were boarded by the check-in officials from quarantine, customs and immigration. Everything went smoothly and they were all really friendly and professional, despite all the rumors we had heard from other sailors that Brisbane had extremely tough check-in procedures. It couldn’t have been easier. Then about 4:00 p.m. as we were just resting and relaxing after our long passage we saw the clouds start to darken, and by 5:00 p.m. the winds had increased to 30 knots, it was pouring and there was just an incredible amount of lightning. Huge jagged streaks came down from the clouds for the longest time with driving rain and gusts up to 35 knots. Finally the lighting stopped, but it continued to rain all night . We just slept through the night, however, being exhausted from the trip and also feeling all safe and secure in our slip. It was not until the next day that we found out that we had gotten there just in time for the biggest and most damaging thunderstorm in Brisbane in the last 25 years! Here is a quote from the newspaper: “ Soldiers, low security prisoners and police recruits will today help to clean up Brisbane, which was declared a natural disaster area after it was lashed by one of the most damaging storms to hit the Queensland capital in a quarter of a century.” Wow – we felt very lucky that we had not been out at sea when it hit! We spent only one night in Rivergate Marina and then moved six miles upriver the next day to the Dockside Marina. 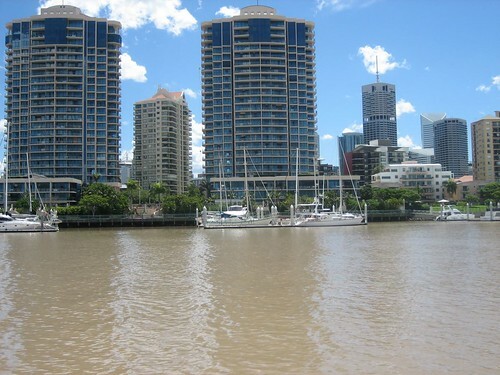 Dockside is right in the center of Brisbane, on one side of the Brisbane River which is lined with dozens of very beautiful condominiums, manicured lawns and gardens, walking paths, several restaurants, and best of all, a ferry dock right at the marina that takes you across the river in 4 minutes to downtown Brisbane. It is a very large city – just jammed with commercial property of all sorts – banks, businesses, restaurants, coffee shops, malls within malls and every kind of retail shop you can imagine. There is a pedestrian mall downtown that stretches for blocks and walking along it at mid-day is like walking through Boston. It is jammed with people. Ferries run up and down the river taking people back and forth to wherever they are headed and there are efficient well marked bus routes and all sorts of public transportation. It is fun to be in such an urban environment for a change. When we moved the boat up to the Dockside Marina from Rivergate we were a little worried about how we would tie up to the dock. Normally there is someone at a marina who can help you by grabbing your boat lines and tying you up to the dock. It is hard for us to do it alone as Mark has to steer the boat and that leaves just me to leap off the boat and tie off 4 lines quickly before the boat drifts off and knocks into neighbors. (Luckily we are rarely at a dock). This marina is mostly for locals who are at work all day and the woman who works in the office told us she can not help with lines. The weather forecast was for strong winds, and there are strong currents on the river which would have made bringing it up to a dock unaided even more difficult. We were in luck though, as our neighbors on the dock we were leaving were actually crew members (on a large and beautiful 68 foot Oyster). They, Lorenzo (Italian) and Candia (German) were nice enough to drive up to the Dockside Marina at the same time as we were sailing up, and then met us on the dock to help with lines. It turned out to be especially helpful because the slip that had been assigned to us had another boat in it when we arrived and we did not know where to bring the boat. We also could not easily contact the office as the woman who runs it does not moniter a VHF. Lorenzo found her by using his cell phone, got us another slip assigned, and then he and Candia walked down the dock and grabbed our lines and easily tied us up. What nice people we meet along the way! It is very strange how some things don’t work very well here though. We have been trying to get a simm for our cell-phone for two whole days now and even though the downtown area is filled with mobile phone shops, we still do not have a working phone. Today we got a simm from Vodaphone – one of the two major suppliers here – and after spending 3 hours in the office – providing them with every piece of information possible (including our passport numbers!) we still do not have a working phone. They insisted on us having a local phone number before they would issue us a cell phone, so we gave them the number of the marina. How can you have a number here if you are getting a phone for the first time? When, after 3 hours, we were still there in the office and the simm did not work, we asked them to simply refund our money so we could go on our way. Unbelievably, they refused saying they do not make refunds. Even when it was clear that it was their product that was not working, and we never even left the office or were able to use the phone for one minute, , they refused, saying that once they sell you something it is “not refundable”. Amazingly frustrating. So, right now we are out $60 for a simm and a pre-paid phone plan that just doesn’t work. We are hoping that maybe the system will accept us somehow later today and we will be able to use the phone. We could get a cell phone chip that worked in all of the very undeveloped countries we have visited (like Vanuatu where most of the cell phone users don’t even wear clothing), but here in Australia it is all a big mystery. At least we can use the internet from the boat here, and tomorrow we will get a regular old phone card and be able to use the pay-phones on shore. It is Sunday, November 16th and we arrived at the Rivergate Marina outside Brisbane at about 1:00 p.m completing our 830 nm passage in 6 nights. The last day of the passage was great – nice wind and smooth seas. All in all a very easy passage. We would have loved to have a little more wind, but with wind you get more ocean swell and therefore more discomfort, so I have to say that I was quite happy with how the trip went. We probably motored about half of the 6 days. We are both very tired now as we did not get enough sleep on the trip – just short stretches – and what we need right now is a quick dinner and a long uninterrupted sleep. We are now more than 600 miles from our departure port of Noumea, New Caledonia and only 200 miles away from our arrival port in Brisbane, Australia. At our current pace we expect to arrive in Brisbane on Sunday. It has been a slow, but comfortable ride. The forecast we had for light winds for most of the week ended up being light winds for the entire week. There is often not enough wind to keep the sails full so we have had to motor at least half of the way. The engine noise and smell gets annoying and we are trying to sail as much as we can even if it means moving along at barely 4 knots (a good speed on Sabbatical III for a passage like this would be more like 7 knots). Days have been mostly clear with phenomenally blue skies and a deep blue ocean. It is warm. There is some ocean swell which keeps the boat rocking a bit, but nothing compared to our trip last year when we banged our way down to New Zealand with strong winds, storms and big seas. The big full moon keeps it bright as day at night except when the occasional rain shower moves through. We take turns sleeping so that someone can look out for ships and make sure the sails are set right. So far we have seen two large ships, but both were several miles away. We have daily radio contact with 3 other boats. We are eating well on the boat, but will be out of all fresh food by the time we arrive. Good thing too as Australian quarantine is known to take away most everything that is not canned. We sailed all night last night in light/moderate winds and rain showers. Today we are mostly motoring as winds are less than 7 knots since noon. The swell has increased to about 6-7 feet. All is well but we are wishing for wind. Course 240 degrees magnetic, motoring at 6 knots. Winds west at 4 knots, seas 2.0-2.2 meters in swells. We left the fuel dock in Noumea at 12:30 pm Monday, well ahead of our planned Tuesday morning departure. There is a storm forecast to come up the east coast of Australia from the south that should reach Brisbane late Sunday night. We wanted to be sure that we were in Bribane before the storm arrived, so we left early. In spite of the forecast of light winds for Monday, we had a terrific sail coming out of New Caledonia. As soon as we left Petite Passe and entered the huge lagoon of New Caledonia, we were making 8.5 knots under sail. We entered the ocean through Passe Dumbea, about 10 miles away. The ocean swells were light and the wind was great. We kept up 8.0 – 8.5 knots in flat seas until 10 pm. Then the wind just died. We motored Monday night in clear skies and an almost full moon. Yesterday (Tuesday) morning, we set poles and set our genoa to port, but when we tried to set our ballooner (spinnaker) to starboard the head of the sail ripped, rendering it unusable. It would have been the perfect sail for much of the day. We improvised by sailing wing-on-wing with the genoa and main. We had to motor a few more hours during the day, but just before sunset the wind came up a bit and we were able to sail all night, although at only 5 knots. The wind has moved forward of the beam this morning and we are motor-sailing in 6 knot winds from NNW and seas less than 1 meter. Skies and clear and the air is warm. We are making 6.3 knots on a course of 239 degrees magnetic. The other good news is that I cannot find any trace of water in the transmission, so the repair we undertook in Noumea seems to have fixed the problem. Both Laura and I heard whales surface near the boat last night but by the time we looked for them, they were gone. I wish they would stay and visit with us for awhile. We left Noumea just two hours before Cardea with Jim and Kevin aboard, and 20 hours before Sol Searcher with Ray and Peggy. We have an informal SSB net with Carea and Sol Searcher every evening. Magnum (Uwe, Anne, and Kara) joins in the net as well even though they are still hanging out in Iles des Pines waiting for more wind.